Rancho Obi-Wan, Inc. is a local and independent 501(c)(3) nonprofit organization that does not receive operating funds from national organizations, government grants, or loans. Our purpose is to serve the public through the collection, conservation, exhibition and interpretation of Star Wars memorabilia and artifacts, using the collection to provide meaningful educational, aesthetic, intellectual and cultural experiences for a wide array of audiences and to carry out other charitable and educational activities associated with this goal. By becoming a "member" of Rancho Obi-Wan you are joining with us to support our endeavors of education and inspiration! 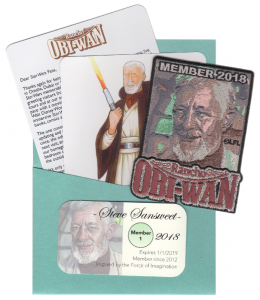 Members get special privileges and offers and as a thank you for your donation we will send you the 2018 Membership Kit with patch art by Kris Penix. In addition, any past member who renews this year will receive a special renewal gift, a 2018 Member lapel pin! Only Members can purchase tour tickets. Tours with one of our excellent docents are $75.00 each. Younglings ages 6-12 are $25. * Donations may be tax-deductible in the U.S. Rancho Obi-Wan, a California nonprofit public benefit corporation, has been granted official tax exempt status (section 501(c)(3) of the Internal Revenue Code) from the United States Internal Revenue Service. Tax-exempt status was granted September 23, 2012 and is retroactive back to the date of creation of the corporation: October 28, 2011. You may be able to deduct donations from your federally-taxable income. Please contact a tax professional for the details of deducting such a donation. Our tax ID# is: 45-3771886. Memberships and donations are not refundable.